Hey Brides! 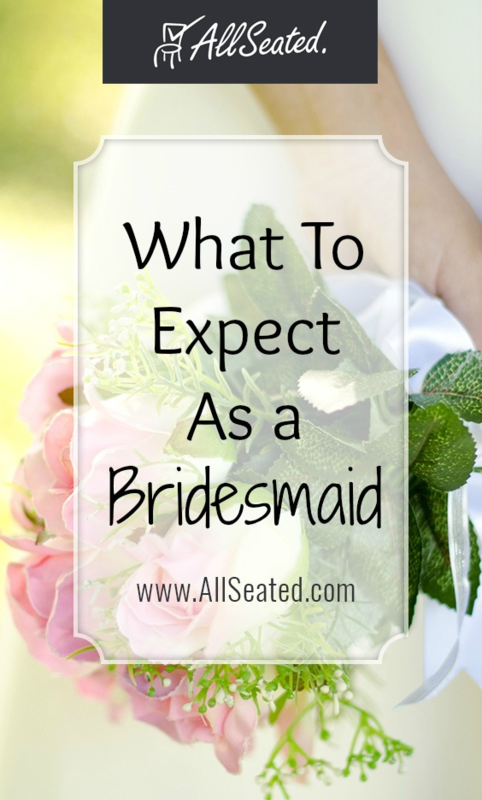 Share this information with your wedding party so they know what to expect as a bridesmaid! The wedding party plays a critical role in a traditional wedding. While it’s an honor to be asked to be a bridesmaid, it’s important to know what the role means before you commit to saying yes. The role of a bridesmaid comes with specific responsibilities. From unexpected expenses to dresses, planning and more, here’s a list of what to expect as a bridesmaid! Being a member of the wedding party means that you most likely will be required to wear a coordinating dress in a specific color selected by the bride. Try not to complain about dress style, color or cut and only offer suggestions if the bride wants your opinion. However, don’t be afraid to speak up if there’s something that seriously makes you uncomfortable. Other than that, it’s not exactly fair to refuse the bride’s favorite color even if it isn’t your cup of tea. Expect to be responsible for the costs associated with your dress, shoes, beauty appointments and any accessories that may come into play. Consider it a pleasant surprise if the bride offers to pay for any of your bridesmaid essentials! Quite often the maid of honor is responsible for much of the planning involved with the bridal shower and bachelorette party. As a bridesmaid, keep in mind that you will be expected to help out with the planning as well as chip in for a portion of the festivities. You may be asked to give a speech, even if you’re not the maid of honor. Bridesmaids and groomsmen often share stories about the wedding couple at engagement parties and rehearsal dinners. If the very thought of this terrifies you, confide in one of the other bridesmaids and perhaps they will step up instead. You may still give the wedding couple a gift for the wedding, as well as a bridal shower gift. Consider pooling with other wedding party members, and set a budget ahead of time to keep costs within a reasonable budget. Whether it’s locking down venues or arranging flowers in preparation for the big day, your help may be requested! Be up front regarding the specific times that you are available and also let the wedding couple know if there are certain tasks or areas of the planning that you are most interested in helping with to make your role even more fun. At the end of the day if the costs seem to be too much for you, talk to the bride. Being in the wedding party of a close friend or family member is a major honor, and one that shouldn’t be taken lightly. While we all drag our feet a little, it should feel more like a labor of love than a complete overhaul of all your finances. Liam Pearson shares his advice for planning the perfect wedding with an online audience through his articles. He works as a wedding organizer and has several years of experience under his belt. Click here for more information.